Partnered with William Greene in the firm of Ingraham & Greene 1806-1807. Began as Lindsay & Inman in 1882. Acquired many souvenir spoon dies from the Watson Co. Acquired by Whiting & Davis in 1964. Makers of sterling baby items and novelties. Successor to International Silver Deposit Works. sterling and silverplated flatware, holloware, and novelties. 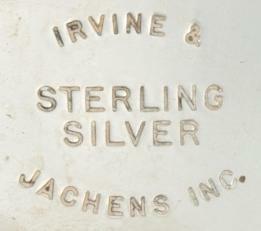 Flatware Patterns by International Silver Co.
With roots back to 1886 when J.C. Irvine set up shop, Irvine & Jachens was formed in 1926 as a successor to the J.C. Irvine Co. Well known emblem, badge, and buckle makers. John G. Ives and Isaac B. Curran.